The leaks just won't stop. Everybody keeps spilling the beans on Google's upcoming Pixel phones. After a UK retailer and a Canadian carrier posted about them early, it's now Verizon's turn. 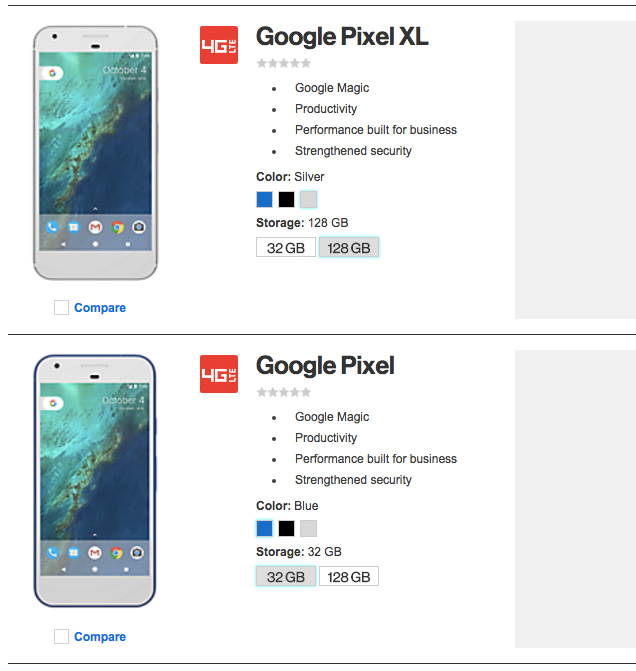 Gizmodo has spotted listings of the upcoming devices on the carrier's Enterprise website, where you can find both the Pixel and the XL under its smartphone section. They also come with a short description of the devices' features, including a mysterious one called "Google Magic." We'll probably find out what that is at Google's big event. Serial leaker Evan Blass (aka evleaks) has also tweeted out an image of the devices for Verizon, and it looks like they will be available in silver/white and blue. Across the pond, Google has applied for a trademark on the name "Pixel," according to The Trademark Ninja. He found the official application on the EU's Intellectual Property Office website after expressing concerns that other companies might block the devices' release in member countries, since Google doesn't own the trademark for the name. In case you're sick and tired of Pixel leaks by now, though, here's an unconfirmed detail about another device that the big G's expected to reveal tomorrow: its Daydream VR headset could be priced for as little as $79. According to Variety, Daydream could be more affordable than the Gear VR and could ship later this month.